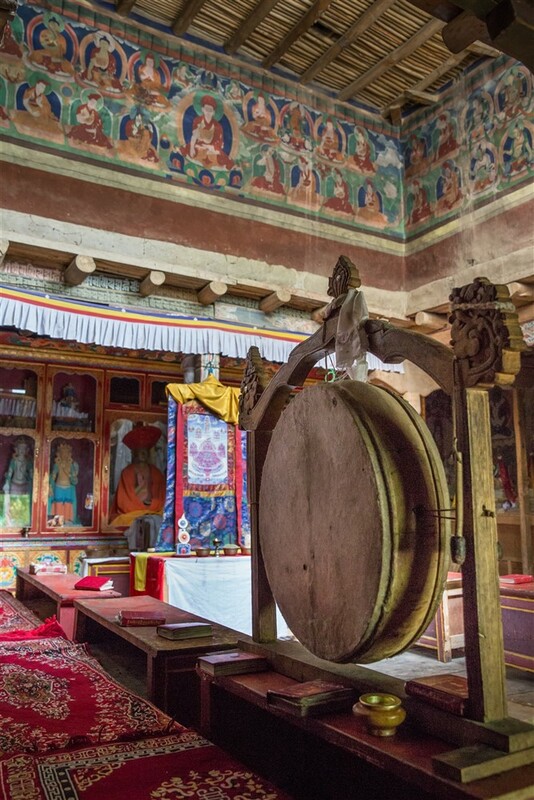 Lamayuru has a mystique quite unlike any other Ladaki monastery. For me it’s probably the spectacular setting that instills this feeling, remote and isolated, and yet not secluded. 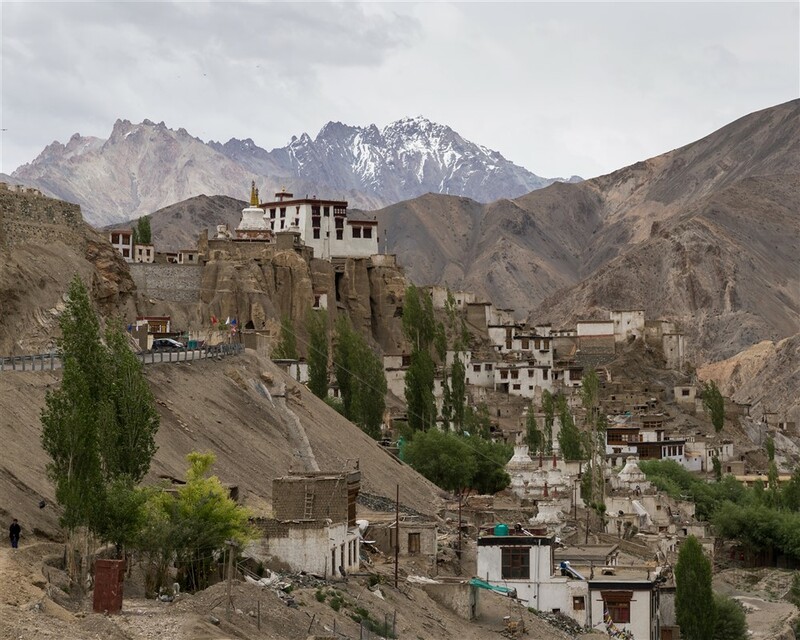 Towering mud brick structures jutting up from the rugged cliffs and scree slopes, my previous visit in 2014 has a number of photos that best show off the surrounding landscape. 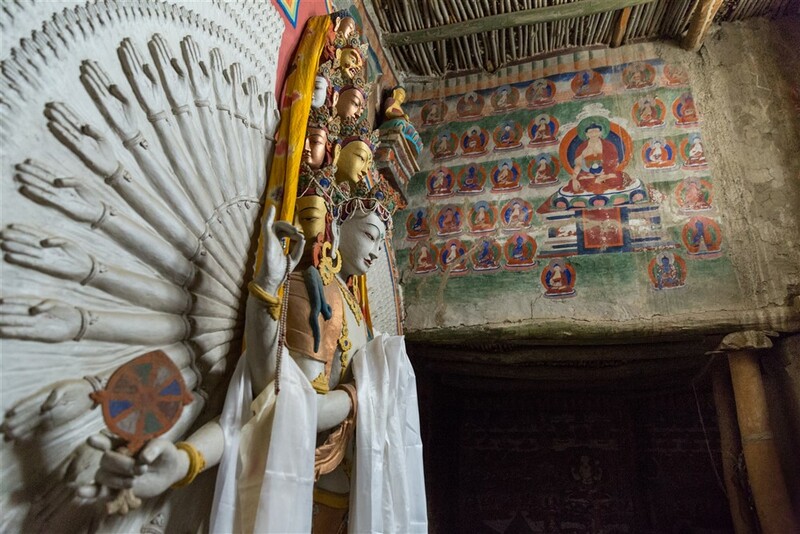 In 2014 there was unfinished business at this gompa, only managing to gain access to the Gonkhang and knowing there was much more to explore. 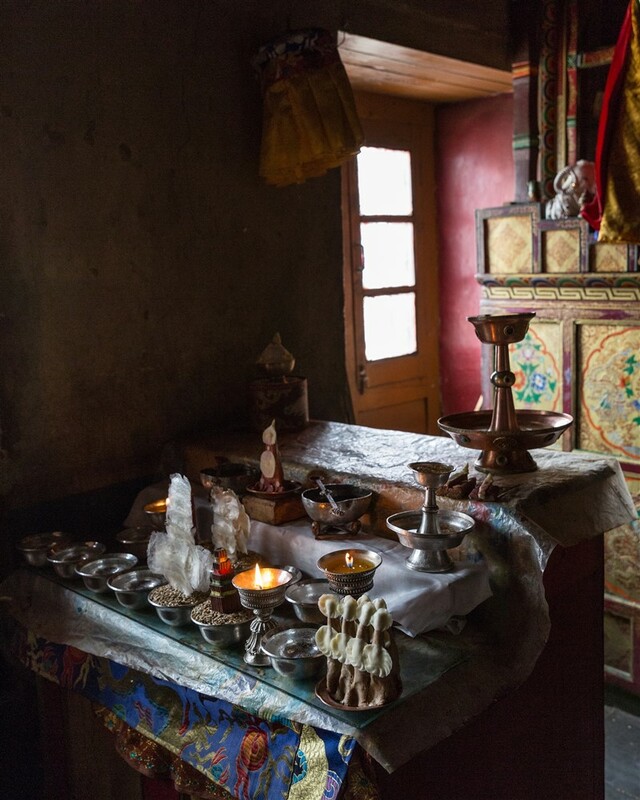 Returning in 2015, I was able to complete the tour in full and capture some of the other spaces that this gompa has to offer. 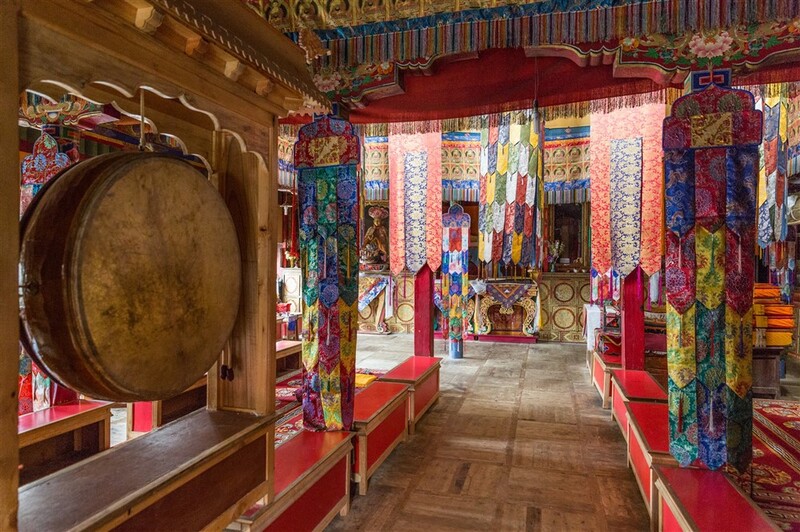 Lamayuru’s Dukhang is the monastery’s main assembly hall, and is an absolute riot of colour. 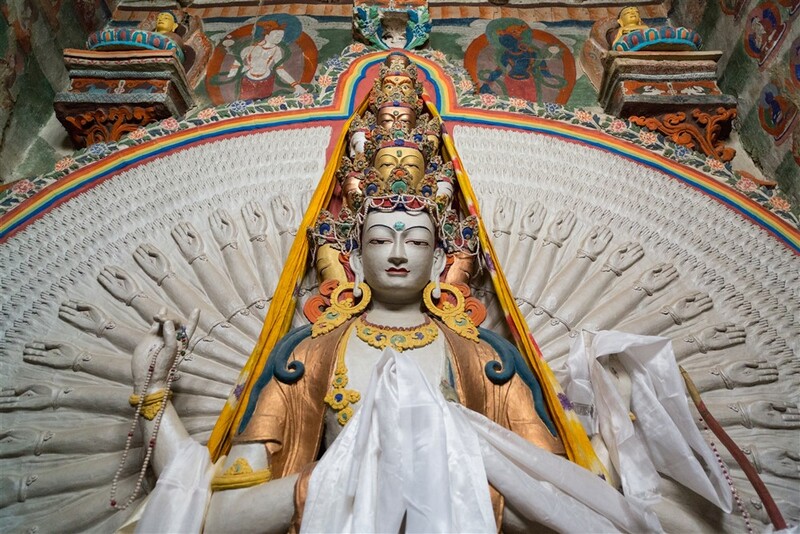 Accessed from a flight of steps at the edge of a cliff, the hall is embellished with a dazzling array of thangkas and other colourful silk hangings. 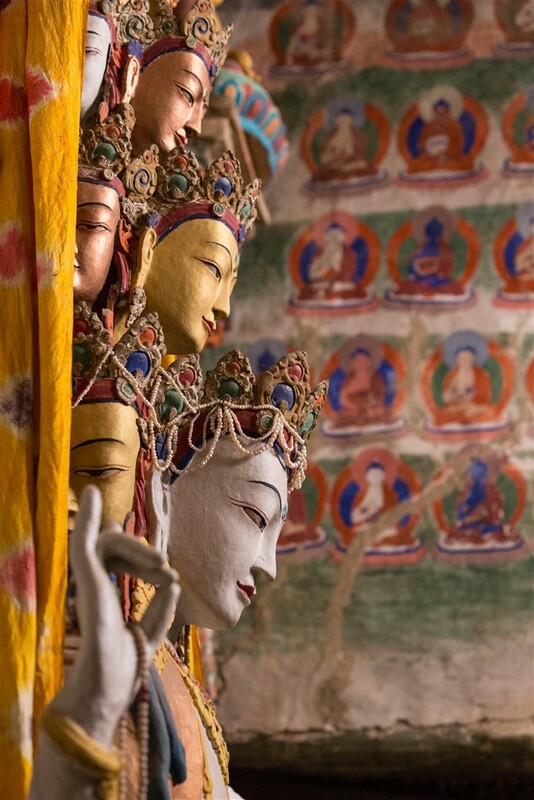 Against the back wall are a series of images behind glass; Guru Rimpoche, Choskyi Lotup (a high lama at Lamayuru), and Skyoba Jigten Sumgon. 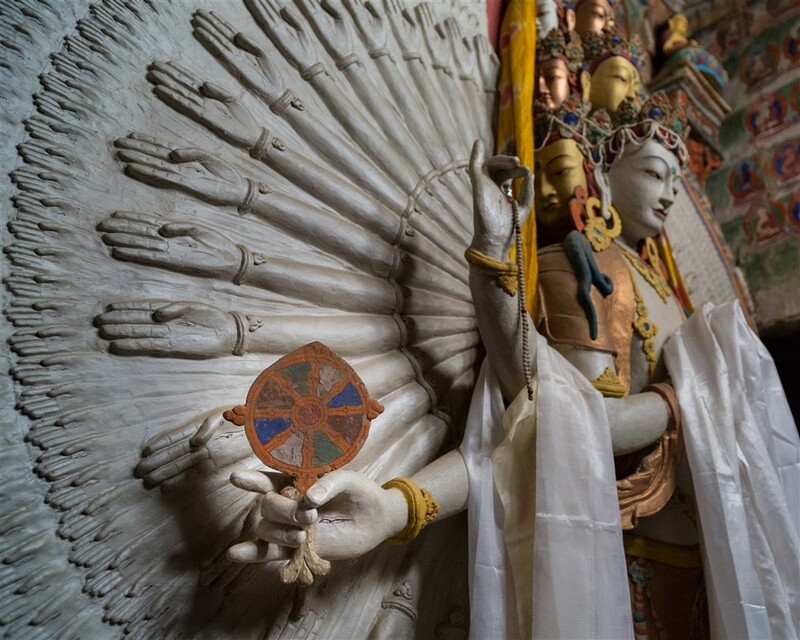 A doorway beside the Buddha statue leads to a rear antichamber with several deities and butter sculptures. On the right Dukhang wall is a small grotto, usually locked. 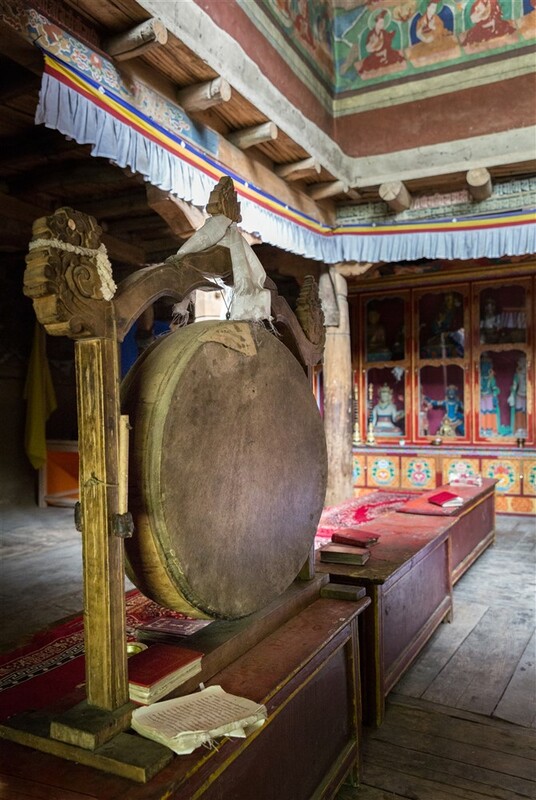 This is where Naropa is believed to have meditated over a thousand years ago. Leaving the Durkhang I made my way to a temple that I suspect many visitors miss you, just as I did a year previously. 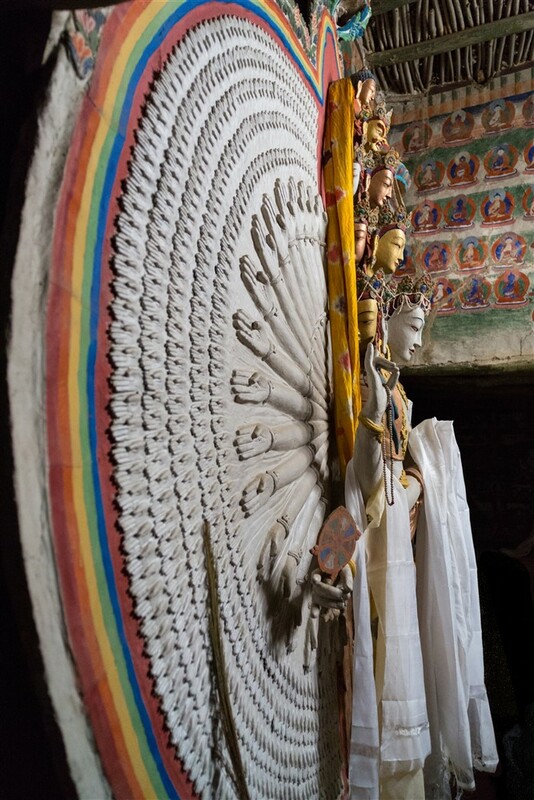 Climbing down from the monastery’s main buildings, you reach a courtyard where stands the Chenresig Lhakhang. This is a large well lit wooden temple dedicated to Avalokiteswara, and is incredibly atmospheric. With a somewhat archaic setting, here you get a real feeling of Lamayuru’s antiquity. 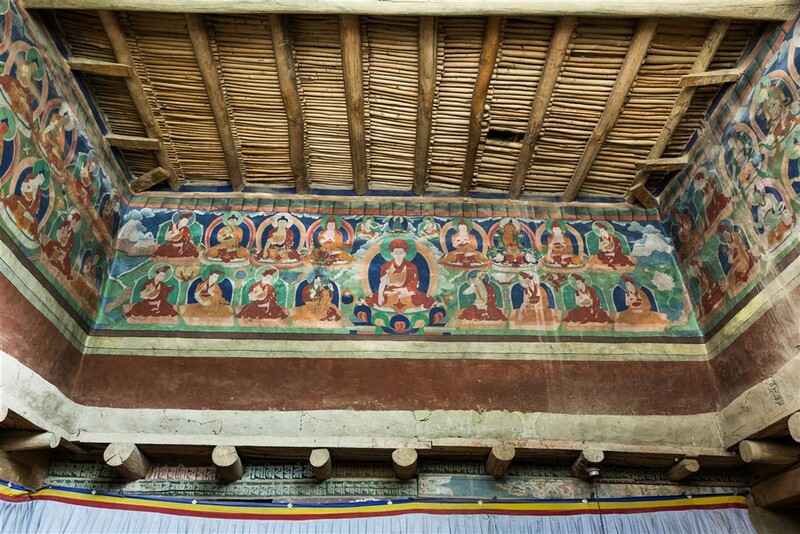 A large image of founder Skyoba Jigten Sumgon sits in the middle of the alter, surrounded by a host of small clay figures. 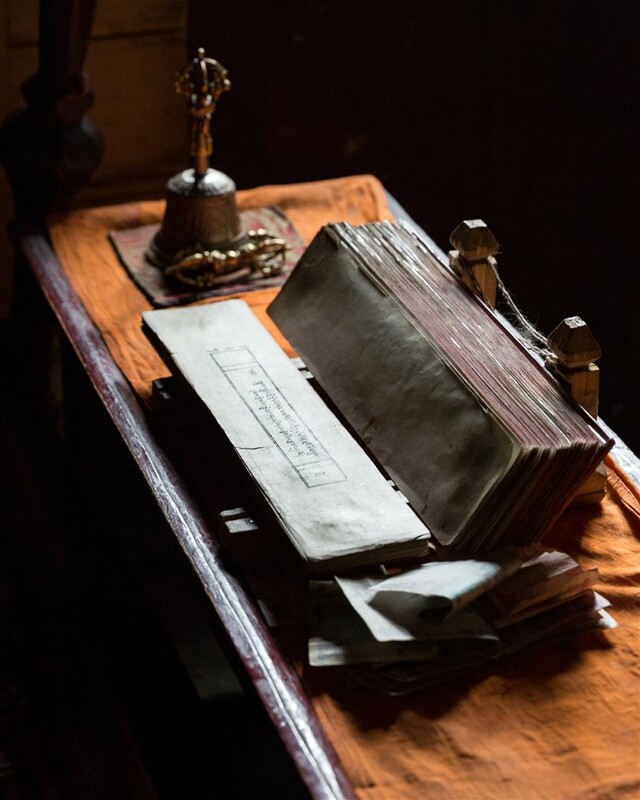 But the wonder of this temple lies behind all of that, and is partially visible behind the alter. Accessed by a doorway to the left, you enter a small antechamber, narrow and long with the temple’s highlight at the far end. 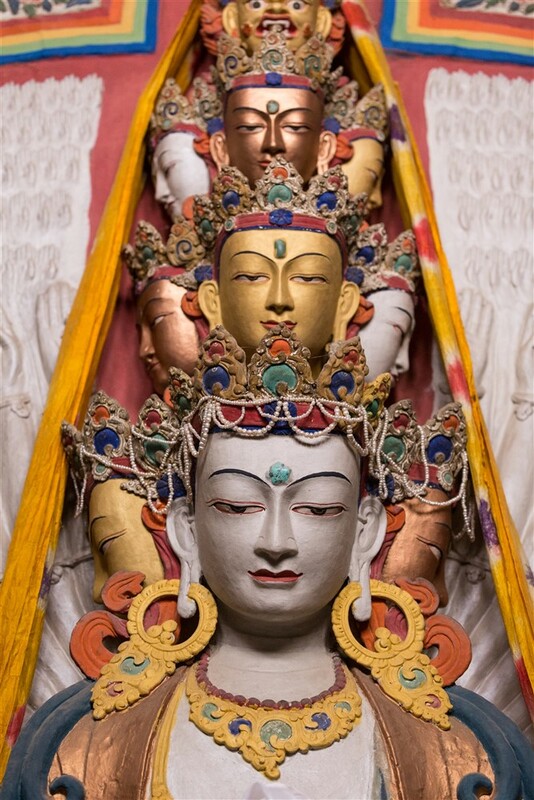 Here is a large and amazingly beautiful image of Avolkiteswara, in his thousand-arm, eleven-headed manifestation. It is simply stunning, and I was captivated for what seemed like hours. As you can imagine, I was keen to try and capture this feeling with photography, but I’m not convinced how successful I’ve been. 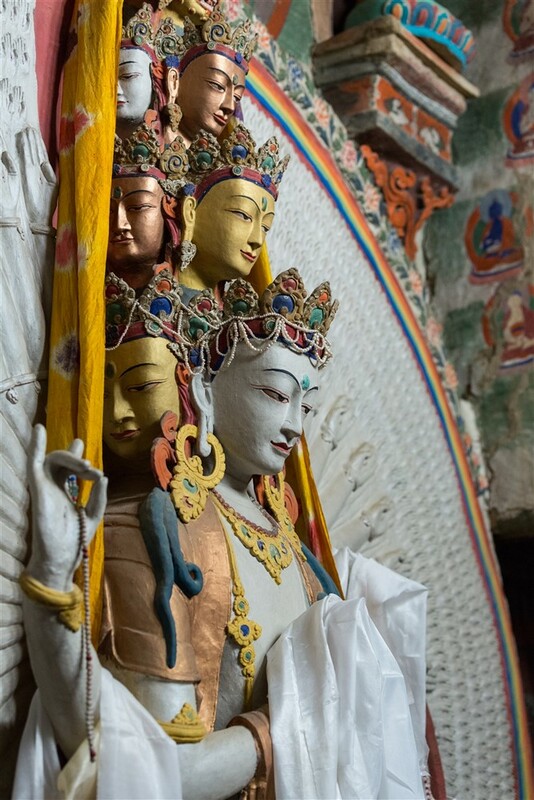 Of all the wide and varied forms of imagery I have seen in the countless gompas I have visited in the region, I don’t think anything can surpass what I saw in this temple. It was the perfect blend of antiquity, atmosphere and aesthetics. 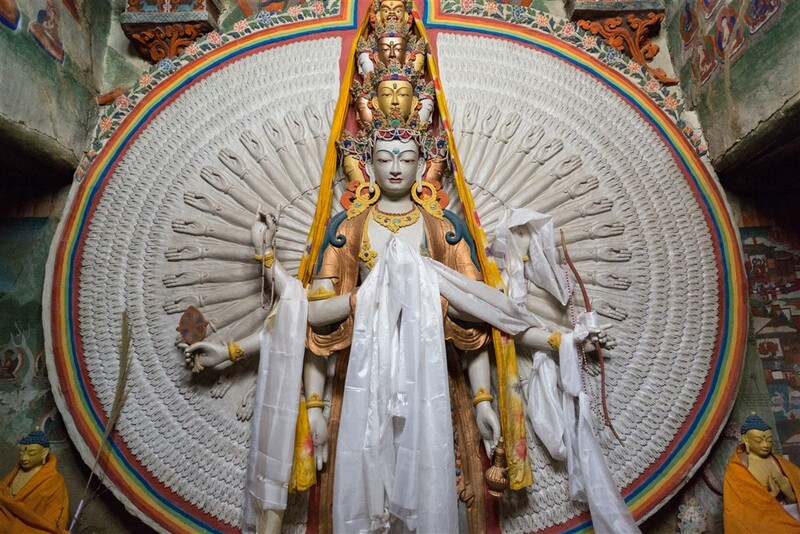 Beautiful bodhisattva. Thank you for sharing this image. You’re welcome, thanks for the comment ! Magnificent images of Avolkiteswara!! An amazing representation!